Today was the first truly fall day, the first day where I have stayed bundled in wool socks and a sweatshirt since coming home from church, the first day where I started pining for Christmas movies, and the first day where I bought a new stash of tea. Fall is here in all of her heavy grey sky, misty rain coziness. And I am ready for it, really I am. I am ready for thick tights and boots, and mugs of cocoa. But not without one last gaze back at summer tomatoes and berries, long days and crickets. When we were little we used to spend our summers eating mulberries. Mulberries, for those of you who didn’t instinctively eat all the local flora and fauna, are the ugly cousins of blackberries. Now, I recognize this. But as a kid, I could care less. They were there and I could eat them until my fingers were totally purple. We put them in muffins, and I think once I even tried making jam without success. Nothing equals summer like berry stained faces. For the three perfect summers during college where I worked at summer camp, I counted the days till the blackberry bushes bent under the weight of ripened fruit. Then I trudged through thorns with my campers to pick fistfuls of berries. We ate most of them, but the few that made it back were added to canned berries and cooked into blackberry cobbler from the Betty Crocker 1954 cookbook. 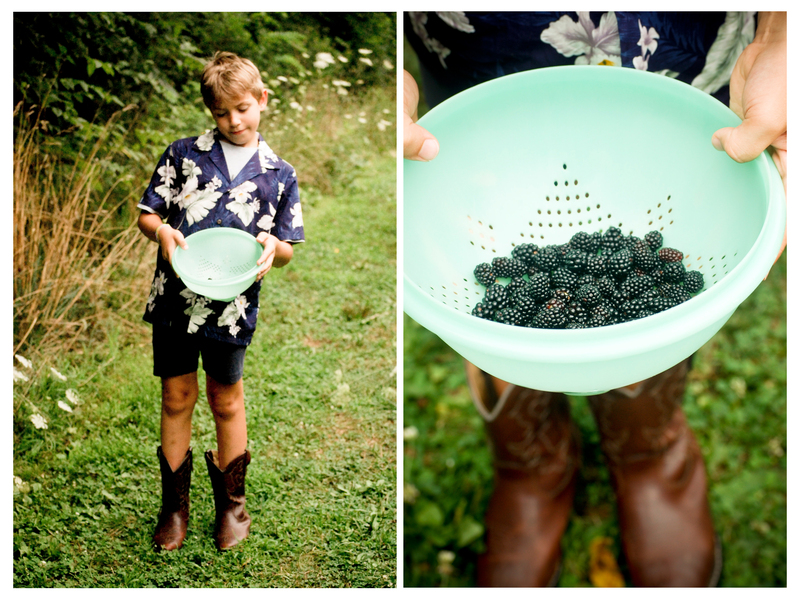 I challenge you to find any recipe for blackberry cobbler that can top Betty’s. If you haven’t read the children’s book The Relatives Came, by Cynthia Rylant, you should. My grandmother keeps a copy and used to read it whenever we all got together. I think someone wrote it after watching a Stone/ Coleman gathering. We eat lots, talk loudly, charge around making messes, and feel delightfully happy all the while. This past summer, my Georgia cousins came. I had been running on some public lands nearby and discovered fields of wild blackberry bushes that had yet to be picked. 8 cousins and two hours later we had picked pounds of blackberries, filled our pockets with flowers, drawn designs on our arms with juice, and pitted beetles against wasps in some of the berry jars. That night there was blackberry lime cake (thank you Smitten Kitchen!) and the following morning there were blackberry pancakes. Thus goes summer. But now back to fall. I guess the beautiful thing about seasonal joys is that you get to live in eternal expectation of them coming again. Summer always returns. And with her come long days full of berry stained hands and nights spent with cousins on the front porch, listening to the gentle symphony of crickets. This entry was posted in Uncategorized and tagged family, seasons, summer. Bookmark the permalink.